We always knew it was coming. The point of convergence where it all leads back to. Perhaps not the greatest moment, but the defining one. In the end, it all comes back to redemption. We will redeem. We will be redeemed. This is the cliffhanger season finale that looms the largest in my memory. Not my favourite...I think “Time's Arrow” and “Descent” are probably better, and I have fonder and more vivid memories of them both. I was told, of course, that I was supposed to like “The Best of Both Worlds”, and “The Best of Both Worlds” is certainly very good at what it does. But this is the one that exerts the greatest gravity over the mental landscape of mine Star Trek: The Next Generation belongs to. The first image that strikes me is, as is always the case with Star Trek: The Next Generation, that of a starship. 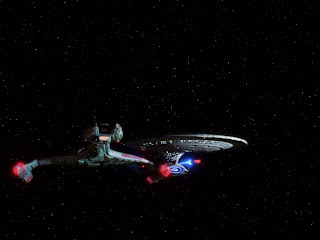 It's the image that defines “Redemption” for me: That of the Enterprise being escorted by the Bortas, the first, and archetypal, Klingon Attack Cruiser. To me, this is simply one of the most iconic designs of the series, occupies a primal, fundamental spot in my memories and is one of those images that defines what Star Trek means to me. The Attack Cruiser was designed by Rick Sternbach, and while it's far from his first or last design for the series, it's one of his signatures. It showcases a lineage from the old Klingon Battlecruisers of yore as well as taking some cues from Federation aesthetics (intentionally, according to Sternbach, to demonstrate the sharing and exchange of ideas brought about by the alliance). But the Klingon Attack Cruiser also demonstrates a fastidiousness that's uniquely Sternbach's: While Andy Probert's starship work tended to be defined by clean, organic elegance, Sternbach's is absolutely loaded up with meticulously thought-out little details-There's every manner of nook, cranny and panel all over the ship, each of which look like they're there for a purpose and are doing something important. Indeed, there's probably a technical manual somewhere that tells you precisely what they all do. It's a dedication to go above and beyond and a pride in getting all of those details right that's as much a hallmark of Star Trek creative and fan spaces as it is of anime communities, and it's here that Rick Sternbach's real heritage starts to shine through. 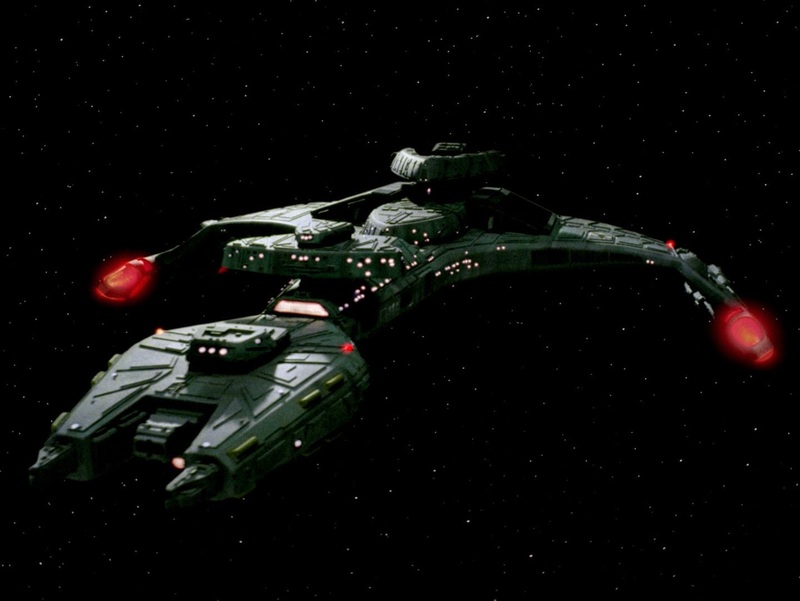 The Klingon Attack Cruiser is actually far more reminiscent of 1980s sci-fi anime mecha designs than it is of the US Navy- and Golden Age Hard SF-inspired designs that characterized Star Trek's earlier years, or even of Andy Probert's unique flavour of artistry. One could very easily imagine it fitting in just as well in Macross or in Dirty Pair as it does here. Among the first wave of Playmates' Star Trek: The Next Generation line was a series of model starships that lit up and played sounds when you pressed some buttons on them. My first starship toys were these, and the first three I ever got were the Enterprise, the Romulan Warbird and the Klingon Attack Cruiser. 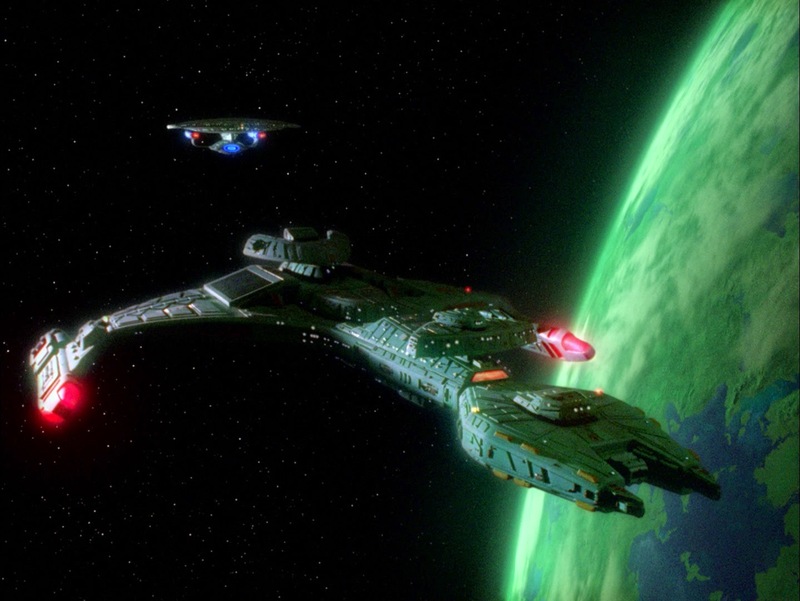 It was from that moment that these three ships, and the communities who sailed on them, became synonymous with Star Trek for me: The Klingons, the Romulans and the Enterprise. Playmates didn't really tell you a whole lot about what these ships were or how they worked beyond some captivating and colourful space art on the boxes, but that was all you needed. There was no Ferengi Marauder, but I always considered that one the honourary fourth musketeer because of the hazier memories evoked in me by some of the older PR stills dating to the first season I had laying around in some of my reference books. After all, it was a Ferengi action figure (based, I believe, on Armin Shimerman's Letek from “The Last Outpost”) who was the second piece of Star Trek merchandise I ever got, so clearly the Ferengi were an indelible part of Star Trek: The Next Generation. Later on, I got Galoob's Micro Machines Star Trek expansions, which had all of them and came with more detailed descriptions of the ships and some basic technical specifications. They also included lists of specific episodes in which they featured prominently, and for the Klingon Attack Cruiser, the episode Galoob picked was naturally “Redemption”. And indeed it's not just the Attack Cruiser, because we know through hindsight that this two-parter in fact features each of the big three ships (and their associated crews) in one capacity or another by the end. It's a delightfully grandiose and bombastic bit of realpolitiking and intrigue featuring all three powers in a galactic staredown match. It also helps that, following “Legacy” and “The Wounded”, “Redemption” commits so much intriguing backstory to the imagined past: Captain Picard being chosen as Gowron's Arbiter of Succession, that Worf killed Duras as a point of vengeance for his unjust discommendation and the idea he has a son back on Earth who is destined to follow the same path he did. Watching it this time, I was struck by how much “Redemption” actually reminded me of Peter Jackson's Lord of the Rings movies, with a lot of dramatic pontificating about honour, treachery, political insurrections and mobilizing for war, almost like epic poetry. When you're young, this is the kind of thing you find really deep and captivating, and I'm sure that contributed to why this one sticks in my memory to the extent it does. 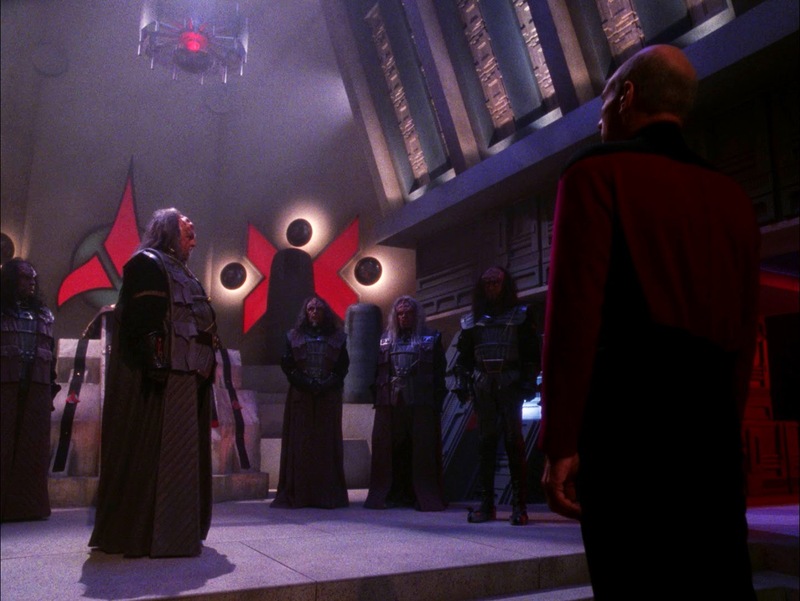 The Klingon Civil War is something I remember much more vividly than it actually plays out onscreen. My memory is that of a breathtaking spectacle of cunning military strategy and dramatic shootouts in the depths of space. In practice, we get a couple old Bird-of-Prey models flitting around Gowron's Attack Cruiser interspersed with stock footage from Star Trek III: The Search for Spock and “Yesterday's Enterprise”. Today I sort of laugh at the slight bombast and pretension of the whole thing, but it's ever so fun to watch again. It's the Klingon characters themselves who I think really make it work: The way Robert O'Reilly, Michael Dorn and Tony Todd play their parts they totally sell the gravity of the situation, implied silliness and all. It's the first and last time the Klingons can really work this way, before they fully devolve into irrelevant, if occasionally adorable, self-parody. So there's that. Which is pretty much completely wrongheaded inside out from top to bottom, but I'm not going to push the issue. And I'd also be remiss not to mention the Duras Sisters, who at the time I just saw as another group of iconic reoccurring members of the Enterprise crew's Rogues Gallery, but nowadays strike me as being pretty clearly stock sexist Femme Fatale, Empress Dowager stereotypes. Which is more than a little unpleasant, to say the least. Director Cliff Bole talks about how the season finale is always the hardest episode of the filming block to shoot, because everyone is burned out and exhausted and can't wait to get to summer vacation. And that's how covering them is starting to feel a bit like for me, especially in the wake of what's got to be the single most tumultuous season in the show's history. I can't wait to put it behind me and move on to other things. Yet at the same time, the monolithic presence that is “Redemption” reminds me that this is a story that belongs as much to the future as it does to the present: The bridge that links the old version of the show to the new one. “Redemption” was planned as the third season finale but pushed ahead to the fourth due to the emergency that necessitated “The Best of Both Worlds”, and there's no other point in the show's history that I could ever imagine “Redemption” belonging to. Not just to Worf's family honour does that title apply. 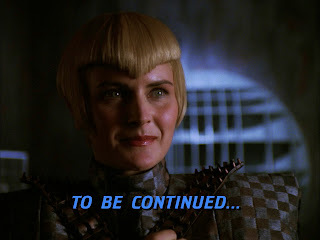 And as if to reassure us that the show is in fact aware of what this moment signifies and the responsibilities it now has to take on, its final scene cuts to Denise Crosby stepping out of the shadows, and then the fade out. This viewing I tried to think about it in context of there being a summer break, several months, between my seeing this cliffhanger. I think that summer is important in a few narrative contexts, the first obviously being that Worf is embroiled in a war that lasts two months, and the second that obviously, inherently (but only if you were there, and not so much if you marathon these things back-to-back) anybody who saw Denise Crosby show up in the last shot had two or more whole months to speculate "OH MY GOD IS IT HER?" It was clearly not just Denise playing a shady Romulan, or they wouldn't be dropping "you never know where humans might pop up" telling dialogue, nor would they have gone out of their way to make her the first ever blonde Romulan. No, this was Romulan-Tasha in every way for people to wonder at, marvel at, gawk at for an entire summer waiting for answers. The answer we got left me cold and effectively cut off the drama at the knees, to say the least, but that's for next week. I'd argue that the only thing elevating the Klingons from already being parody are O'Reilly and Todd's performances, and yeah, even the performances from the stock archetypal Duras sisters. I'd also say that the reason the episode looms large in many a memory despite being surprisingly simple and spartan about space battles and a sense of scale is because of the economy of storytelling. This one essentially belongs to Worf, Picard, and the guest cast. All the fun ensemble bits where the crew get to do cool things are in Part II. My favorite thing has to be Gowron's fatal wide-eyed reactions. "THE COUNCIL KNEW?!" As I understand the Klingon forehead makeup (much like the dwarves of a Peter Jackson movie, which were essentially just diminutive medieval Klingons) prevents any expressiveness in the eyebrows, limiting an actors emotive range, so they had to do a lot of eyeball acting, dramatic rather than subtle, for there to be an effect on their whole face that gives that sense of emotion. And O'Reilly just goes all-in on it. I suppose I could also tie this back to the Season 1 predicament and eventual evolution of the Ferengi from a sort of vague, interesting threat into a more stock Fantasy archetypal race. While the Ferengi essentially are recast as Space Goblins, here, by this point by and large the Klingons are recast as Space Dwarves (sort of incorporating the overt "Space Viking" references). The Romulans meanwhile continue slowly evoking Dark Elves. It's not the most nuanced of scenarios, but it is a sort of common fictional language that can give a casual viewer an easy sense of a fictitious history for these cultures. The limiting thing about that, then, is that for Klingon episodes to be relevant in the future now that they've been recast as Space Dwarves, they'll almost by default have to feature in some sort of Epic Quest plot, and to take a page out of Tolkien again, that means Ancient Treasures or Bloody Revenge. Oh Sela. So much potential as a character, and so utterly wasted! Poor Crosby seems to keep getting saddled with those, doesn't she? For me as a kid, watching these when they first came out, her reveal was the only cliffhanger as memorable, as conducive to a long summer of agonized speculation, as the "Best of Both Worlds" one. I'm really looking forward to seeing what you have to say about it! Call me an organizational nerd, but the thing I'm most looking forward to is learning whether or not Josh will be alternating between TNG and DSN episodes in production date order, come season 6. This more than anything haunts my dreams, including the prospect of 1:1 comparison between late-era Next Gen and early-era Deep Space episodes. "My favorite thing has to be Gowron's fatal wide-eyed reactions." If writing for Star Trek is anything like Michael Pillar makes it out to be, I can actually understand why Moore would characterize Worf being "the fun one", as opposed to the other characters.
" It may surprise you to learn that when I took over as head writer, the entire writing staff of Star Trek: The Next Generation was so frustrated and angry with Gene Roddenberry they were counting the days before their contracts expired (and indeed every one of them left at season’s end.) He wouldn’t let them out of the box and they were suffocating. Pillar goes on to explain how the restrictions taught him to be a much better writer, and how he punched up Moore's script in a way that, depending on how you read it, is either completely faithful to Roddenberry's vision, or is just restating the original pitch with one new element (Aliens give the boy the hologram, the inability to accept death is an external temptation rather than an exploration of the negative side of the holodeck) to make Roddenberry happy. The eventual product, with Moore's beloved Worf as the one allowed to fully express grief and emotion at being an orphan and to eventually help the kid through, is a fantastic episode. By season 4, of course, Roddenberry's involvement has actively diminished, but the work culture didn't seem to have much changed. But it's almost certainly easier to argue that a Klingon doesn't see the world the way the rest of the cast does, and getting to write cultures like the Klingons and Romulans that are chockful of raw emotion and baleful thoughts, would be a relief sometimes. Worf and Picard's genuine and affecting exchanges, where both are in the right, and have very clear reasons for why they are doing what they are doing... Just wonderful work from both Dorn and Stewart. But that kind of conflict is hard to come up with on a deadline. Doesn't excuse it, but makes it somewhat more understandable. That said, dang is this a good set of episodes! It's one of the few times I remember seeing a culture of paranoid and cunning folks like the Romulans actually act like it, and feel as smart and dangerous as they're supposed to. I’m looking forward to your treatment of part 2. Fade In is such a lovely book. I haven't read it all the way through yet, but I'm going to for this project. I've got something special planned for it. Thanks so much for quoting from it. I remember being so excited about this cliffhanger as a teen, it blew me away then. Now thinking back to me last rewatch the whole thing was kind of less than it was back in the days for me. Gowron's eyes will always be my favourite thing though - that sounds like some great exclamation: "BY GOWRON'S EYES!"